After winning Telangana elections with grand majority, KCR has announced that TRS will play significant role in national politics. Telangana Chief Minister is set on his mission to form Federal Front. KCR has landed in Visakhapatnam on Sunday. KCR was accompanied by his family members in a special aircraft. KCR and his family offered special prayers at Rajasyamala Temple. They then visited Sharada Peetham to seek blessings of Swami Swarupanandendra. 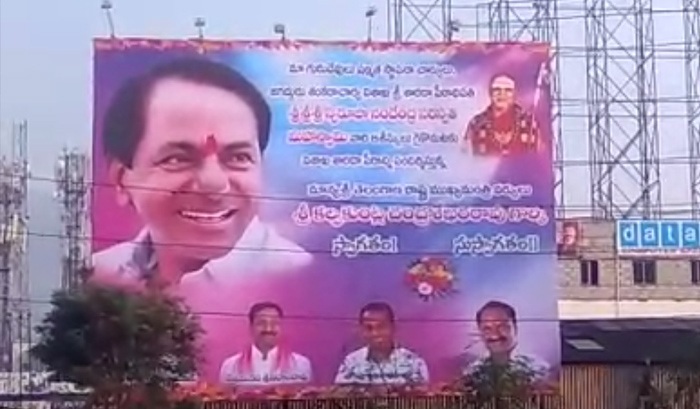 Huge cut-outs and banners of TRS chief have been set-up in Vizag to welcome KCR. KCR will be touring in neighboring states meeting Chief Ministers to discuss plans on Federal Front. KCR will leave for Bhubaneswar in the evening to meet Odisha Chief Minister Naveen Patnaik and visit Konark Temple and Jagannadha Temple. On Monday, KCR will leave to Kolkata to meet West Bengal CM Mamata Banerjee and visit Kalimatha Temple. He will also be visiting New Delhi to hold meetings with Mayawati and Akhilesh Yadav. Reportedly, KCR has taken appointment to meet Prime Minister Narendra Modi. Next articleSamantha turns mother to her father!